Aren’t these the cutest egg cupcakes ever? 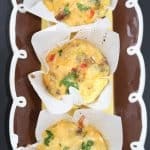 These Mini Sausage and Egg Casseroles are deliciously savory and satisfying, the perfect easy treat for holiday guests. You would imagine that after you have fed your family the biggest meal of the year they wouldn’t want breakfast – not so. They are still hungry the next day. Even when you say you are going to take it easy and not overdo it for breakfast, the guests still have to eat. What a nice surprise this will be for them and you. They are quick, healthy and delicious. The parchment wrappers take longer to create than the casserole. Feel free to choose muffin wrappers. These are based on a classic recipe that my mom used to make. I’ve changed it by adding red peppers, onions and parsley for color. Not to mention I try to add extra veggies wherever I can. Spinach and mushrooms would also be delicious. The sausage is important here. I love maple sausage – it is the best and adds sweetness to this recipe but it’s okay if you can’t find it. Hmm, maybe add some maple syrup. So let’s talk about those super cute parchment wrappers. I’ve always wanted to know how to make these. I did have muffin wrappers but these are way better. I cut parchment paper in 5-inch squares. Use the individual sheets of parchment so you don’t have to fight with the rolled up stuff. So annoying! Need More Egg Recipes in Your Life? 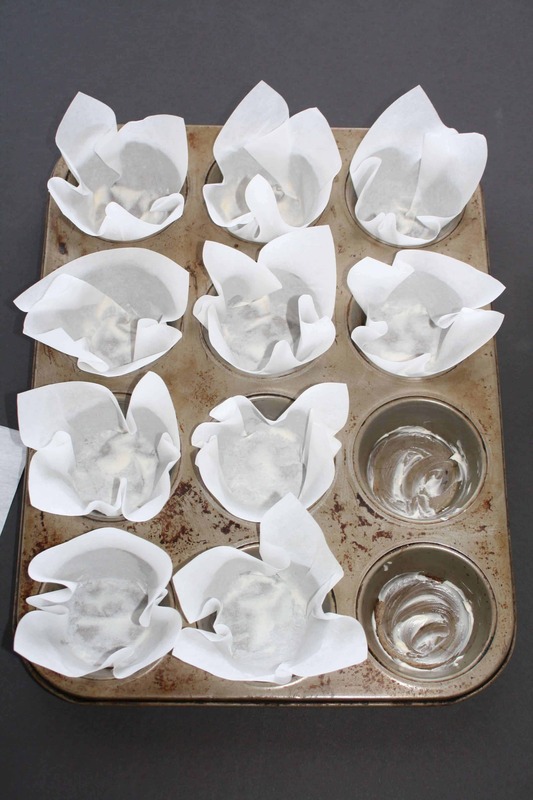 Then I put a little butter spread in the bottom of each muffin tin and spread it around. This is the glue. Put your parchment square in and try to flatten it out on the bottom. I found a glass that I could fit in to push it down. It won’t be perfect but try to crease it down as much as you can. You are good to go. 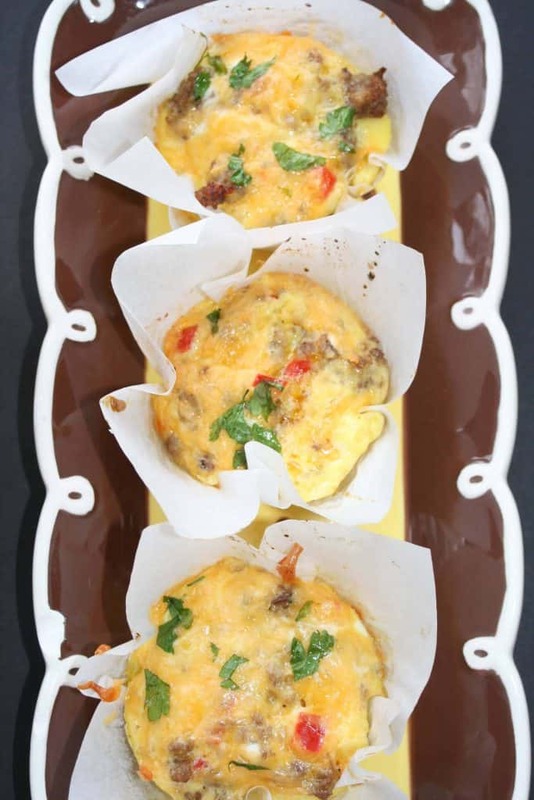 These Mini Sausage and Egg Casseroles are super cute to serve for house guests. 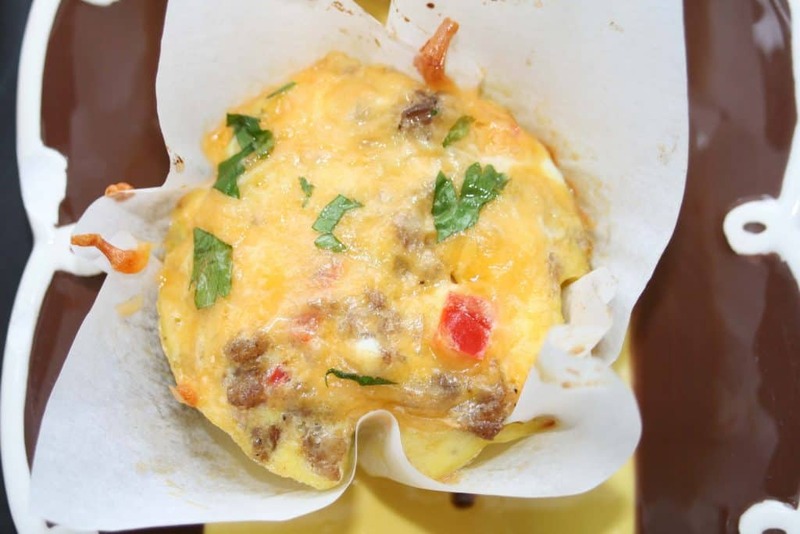 They are packed with savory sausage, vegetables and cheese. Brown maple sausage while crumbling into small pieces. Drain on paper towels. Saute peppers and onions for 5-10 minutes in a little bit of butter. Add to sausage. Whisk eggs, milk, dry mustard, salt and pepper. Start to assemble. Put a few cubes of bread in the bottom of the muffin tins. Add some sausage and pepper mixture. Top with a tbsp or so of grated cheddar then pour egg mixture over top. Careful not to fill too full. Bake at 350 degrees for about 20 minutes or until toothpick inserted comes out clean. Make these the night before and then reheat in the morning for an easy breakfast.